The famous reindeer hunter Jo Gjende was out hunting on the Memurubrean glacier in Jotunheimen. To his great surprise, he met a local farmer carrying a saddle on his back. Upon enquiring, he was told a sad story. The farmer had lost his horse to a crevasse. The unlucky animal had been stuck in the top of a crack in the glacial ice, but even though the farmer had tried his best, he had been unable to get it up. Upon removing the saddle, the poor horse slid further into the crevasse. When the farmer finally left, he could still hear the ringing of the horse’s bell from deep inside the ice. This mid-19th century story of a horse lost in a crevasse is just one of many similar stories of high altitude pack animals. Crossing high mountain terrain could be dangerous, and not only humans died during mountain crossings. Their pack animals regularly died en-route too, for some of the same reasons as humans. Rock falls, avalanches, exposure and falling into crevasses were some of the risks common to humans and animals (see the blogpost on human bodies from the ice here). The pack animals met additional risks. If an animal suffered a fall and a broken leg, they were killed on the spot or just left behind, and their load transferred to other pack animals. There is also the question of fodder, when crossing long stretches of high altitude terrain. In this blogpost, we will look at the sorry fate of some of the pack animals, mainly those that met their destiny on or in the ice. We start on our home turf: the Lendbreen ice patch, on the ancient trail that led over the ice and through the pass. Perhaps “home turf” is not a good metaphor; the landscape here is a wasteland of rocks and ice. The horse skull, belonging to a c. 300 year old packhorse, as it was found at the ice. Photo: Espen Finstad, Oppland County Council. We had taken a coffee break during the survey at the Lendbreen ice patch, when Espen and Reidar came down from above with excited voices: “There is a complete horse skull further up the slope!” The break was over immediately and we scrambled up the hillside. 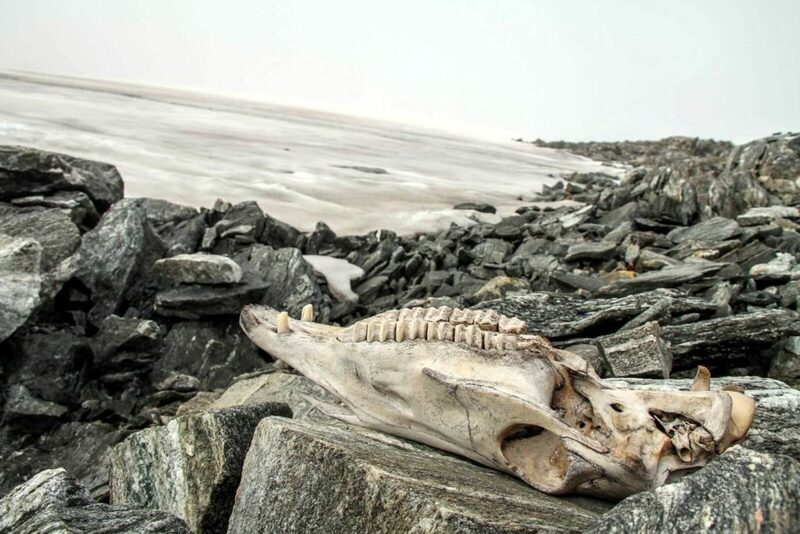 There it was: The skull from an unlucky packhorse that did not make it across the ice. The skull was found at the ice edge in the lower part of the Lendbreen ice patch. Later the same year we also found the pelvis bones of a horse further downslope from the skull. A previous year, we had found a horse mandible (lower jaw) 250 m further up the slope, close to the actual pass. They all came out with a similar radiocarbon date – an age of c. 300 years. The degree of preservation is also very similar. 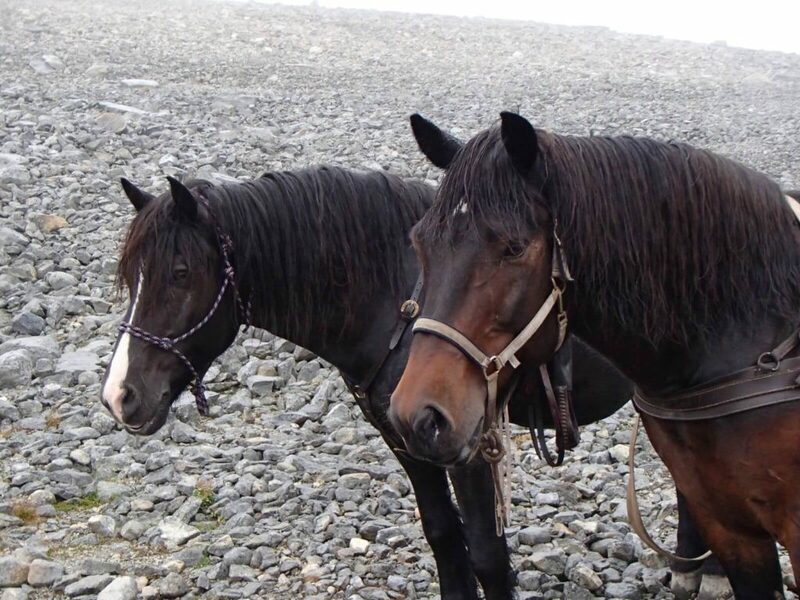 It is likely that they all belong to the same horse, though this would need DNA-analysis for final confirmation. If this is correct, the horse died in the pass, close to where the mandible was found. After it was skeletonized, meltwater transported parts of the skeleton downslope. It is likely that the Lendbreen ice still contains additional bones from the unlucky horse. 1500-year-old horse mandible found at the Lendbreen ice patch. Photo: James Barrett, University of Cambridge. There is one further find of a dead packhorse at Lendbreen. 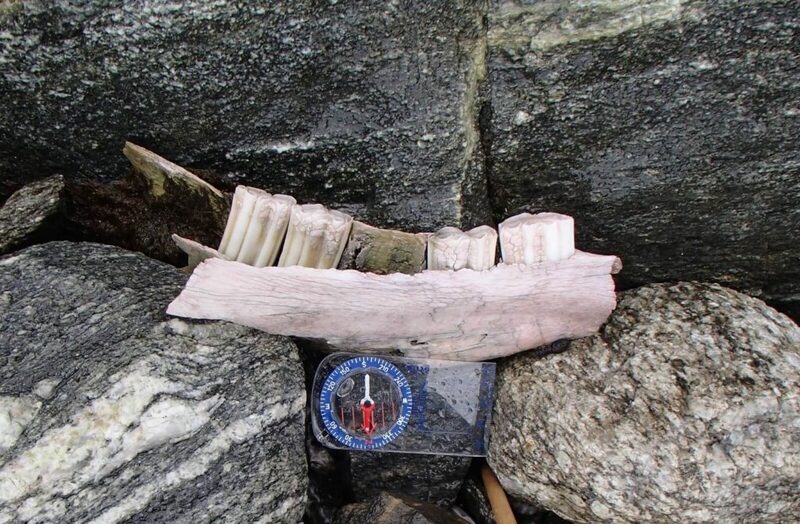 A part of a c. 1500-year-old mandible was recovered from the foot of the Lendbreen ice patch. The actual horse bones are just one piece of evidence for the use of packhorses here. Other finds include iron horseshoes and horse dung. 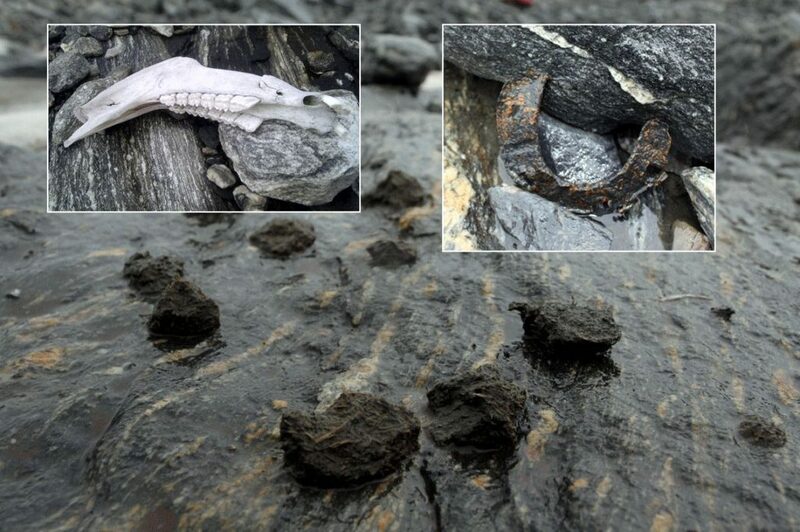 The radiocarbon-dated horse dung from the glaciated pass belongs to the Viking Age and Early Medieval period (c. AD 800-1300), while the horseshoes are Medieval. Packhorse finds from the Lendbreen pass. Horse dung, radiocarbon-dated to c. AD 800-1300. Upper left: Mandible from the 300-year-old pack horse. Upper right: Medieval horseshoe. Photos: Oppland County Council. Lendbreen is an ice patch without crevasses, so we can rule out falling into a crevasse as a cause of death. The trip over the pass was quite short, so lack of fodder is also out. More likely, the packhorses suffered a fall and a broken leg or they died from exhaustion. Jakop Brennhaug’s packhorses. They carry our equipment up to our basecamp at Lendbreen, following the old trail that ultimately led across the ice and through the pass. Photo: Oppland County Council. The use of packhorses in the Lendbreen area continues. Today, packhorses are mostly used for transporting reindeer meat from the hunt in the fall. We use them for transporting our equipment, when undertaking fieldwork at the Lendbreen ice patch and other sites. The horses can carry up to 100 kilos each. Jakop, the owner, tells us he will not venture higher than our campsite by the lake (1650 m), as the terrain further up is too dangerous for the horses, due to the lack of snow and ice covering the scree. This is an important point. Before we move on to the Alps and the Himalayas, we will return to the fateful ringing of the horse’s bell deep inside the glacier ice. It is worth considering why humans chose to cross the ice with their pack animals, when there were such grave dangers involved? The answer is that the glaciers were not only potential death traps; they were also high altitude highways. Struggling in the scree among rocks and boulders carried its own risks; it was painfully slow and the chances of falling and breaking bones were always present. When the snow on the glaciers was thick and firm, it allowed for quick transport on an even terrain. Sometimes, crossing the snow-covered glaciers provided the only accessible route across the mountains. 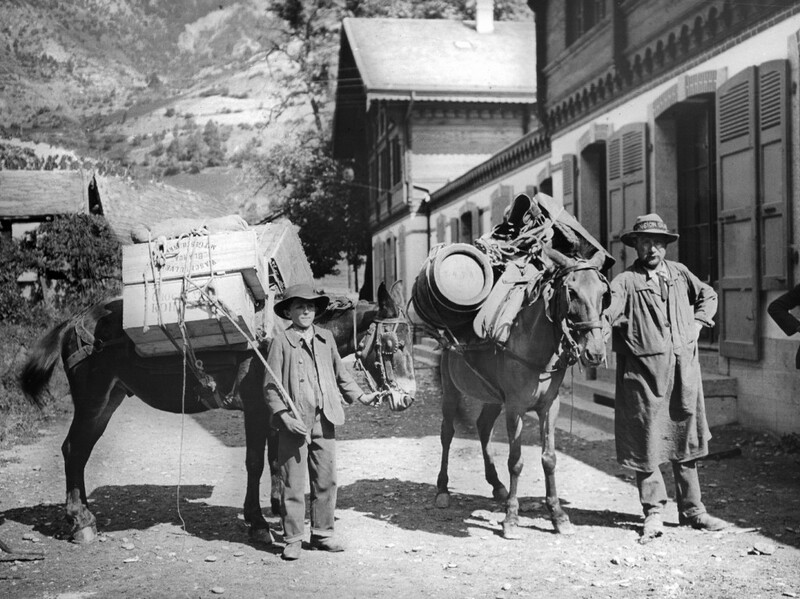 Pack mules in the Swiss Alps, 1910. Source. Mules are known to be very calm and sturdy animals and not afraid of heights. For this reason, they were very popular as pack animals. 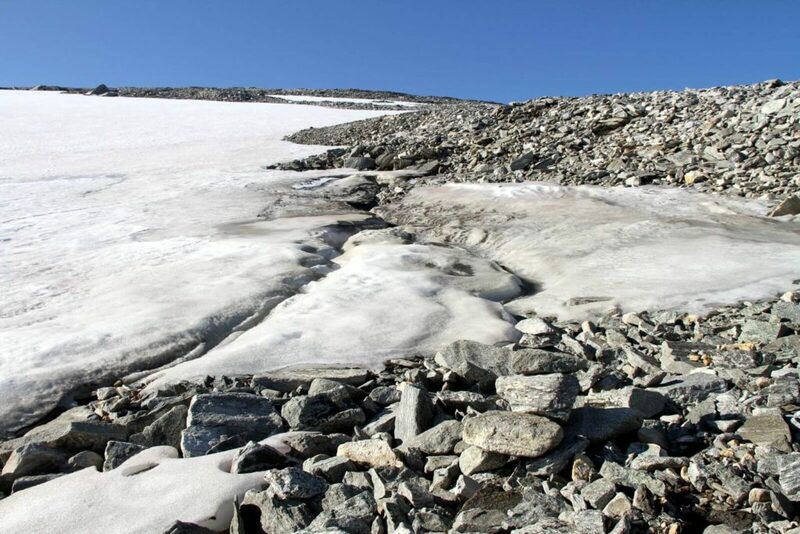 Bones from mules have been found in the ice on several pass sites in the Alps. Mules were used for this type of transport into the 20th century here. How far back they were used is not known, but it may have started already in the Iron Age. The first written sources describing what must be pack mules are late Medieval. 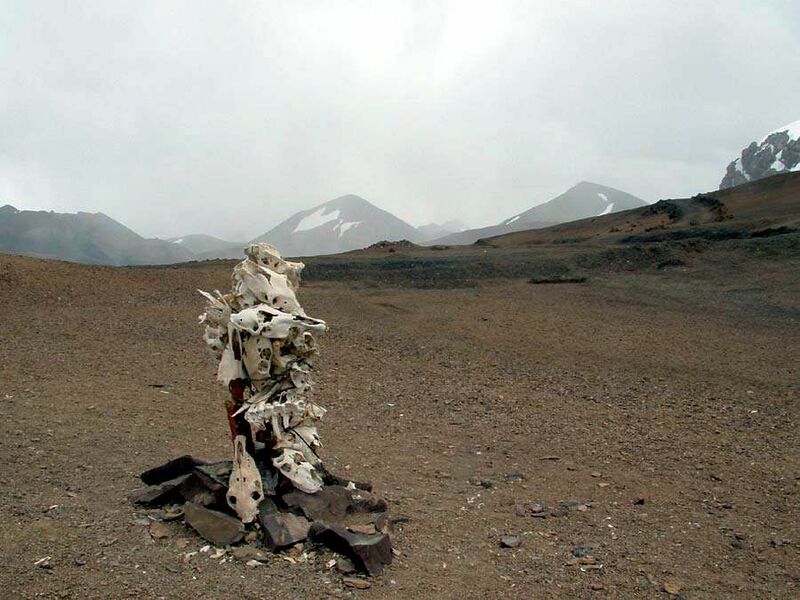 The largest assemblage of mule bones are known from the Theodul glacier, also known for the find of the Theodul mercenary. Bones from at least six different mules have been recovered here. Two radiocarbon dates of mule bones are c. 500 and c. 200 years old. Chances of finding mule bones in the Alps dating back as early as the AD 500 packhorse mandible from the Lendbreen ice patch are slim. Most mountain ice in the Alps is glacier ice, which does not allow for very old finds (read about the difference between glaciers and ice patches here). 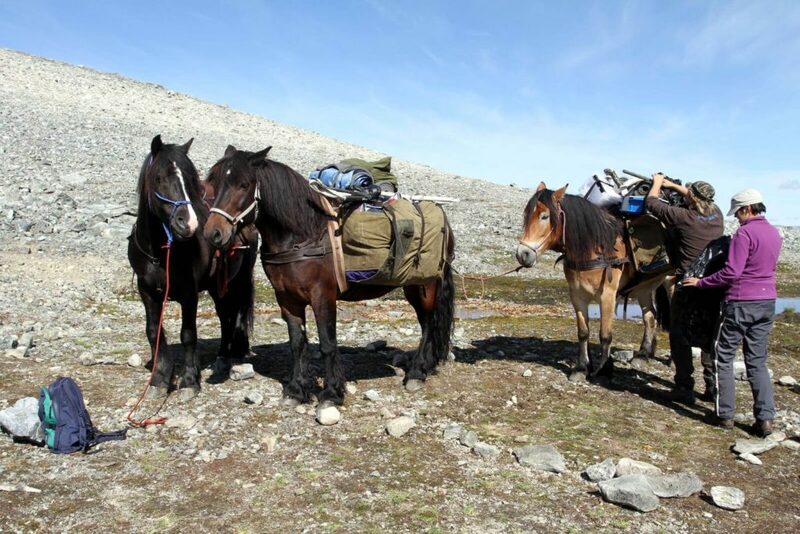 Packhorses resting after making the ascent to the Lendbreen basecamp. Photo: James Barrett, University of Cambridge. Old mountain routes can often still be followed by the original cairns, but it is hard to gain information about the age of the routes, as the cairns are not normally datable. The finds of dead pack animals provides direct evidence of when a certain mountain route was used. This adds a lot of information on ancient trading routes and of human use of the high-alpine landscape. The recovery of biological remains of pack animals also opens up the possibility of doing ancient DNA analysis to trace the biological history of the animals. So far, ancient DNA research has concentrated on the artefacts of animal origin (such as clothing) found together with Ötzi. The dead pack animals should provide good material for ancient DNA analysis. We are hoping to see the first ancient DNA analysis of the 1500-year-old horse mandible from Lendbreen in 2017, fingers crossed. The impressive work of our colleagues in the Alps has inspired us to look for ancient trails over glaciers in our own region. We know from the Lendbreen site that humans crossed the ice here as well. A few historical sources yield tantalizing hints at a forgotten route crossing two large glaciers in the heart of the Jotunheimen mountains. We plan to survey this lost trail next summer. We are very hopeful that there will be finds, but if so: how has the moving ice of the glaciers treated the artefacts? Will we be able to recover bones from unlucky packhorses? Hopefully, we can look forward to excited postings from the field next summer.